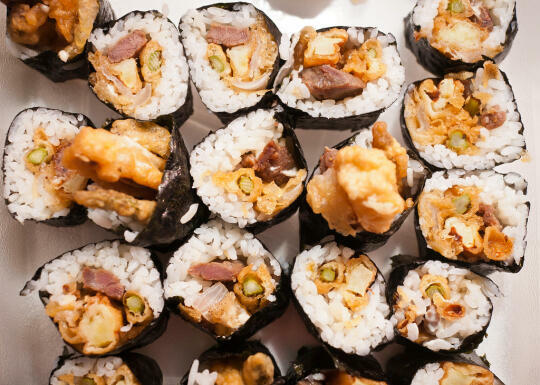 Question: What do you do when you’re tasked with making sushi for a group of friends, but one of your male friends has never eaten sushi and refuses to try raw fish? But what on earth is “Man Sushi”? Well, what sort of food does your stereotypical man love? That’s an easy one: beef, and anything battered and fried. Of course. 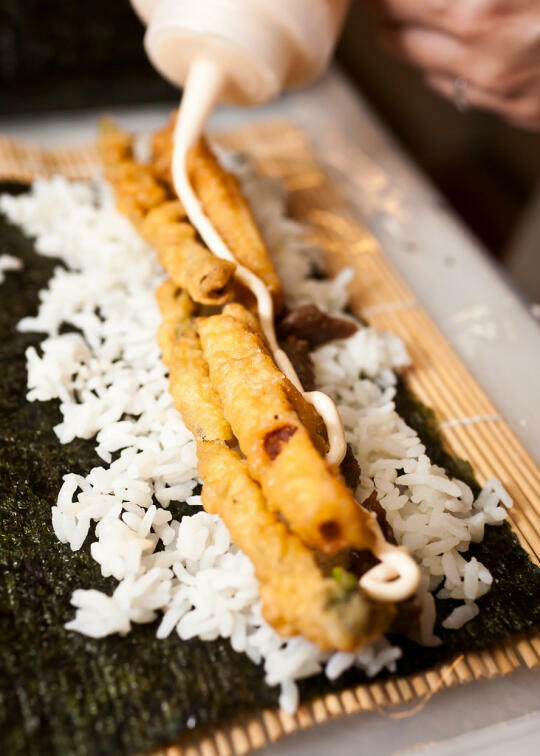 All you have to do is put grilled beef teriyaki and tempura-fried vegetables in a sushi roll, (and throw in some spicy mayonnaise for good measure), and you’ll have a roll that your man will not only try, but will still be talking about a year later. Case in point, I visited some friends of mine in Las Vegas in spring of 2010, and somehow got roped into making sushi for everyone. 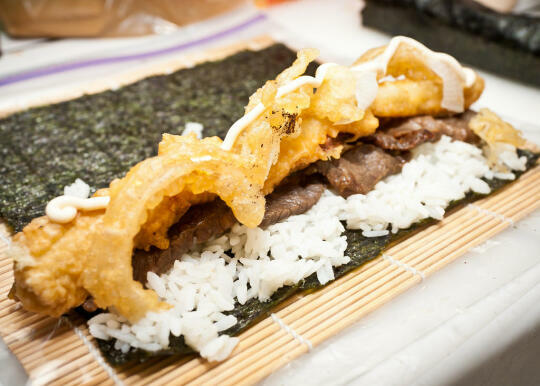 In addition to my ever-popular Spicy Shrimp Inari and a variation on the Refugee from Reality Roll, I had them grill up some beef teriyaki (from this recipe) and I fried up some tempura vegetables for this roll. Japan still needs your help! Tara, a food blogger/writer of whom I’m a huge fan, wrote a book about her time living in Japan. All proceeds go to Japan relief funds. She’s an awesome writer, so I highly recommend buying her book. Congratulations to Lara, who won last week’s Good Fish cookbook giveaway! And lastly… I’m going to be speaking at BlogWorld Los Angeles this November!!! I’ll be giving two presentations – one will consist of me developing a WordPress theme from start to finish, live in front of the attendees, and the other will be all about microformats and Google’s Recipe View. If you want to attend BlogWorld Los Angeles, and maybe even come see me speak, you can buy tickets here, and you can use the code BWELA20 to get 20% off. Place the meat in the marinade, and refrigerate overnight (or at least 1 hour), mixing every now and then so the all the meat gets marinated on all sides. Weave the meat onto skewers, and spread it so it is flat. If the strip of meat is short, put two or three strips of meat on the skewer. Discard the marinade. Barbecue the meat until it is well cooked. Remove the skewers from the meat. 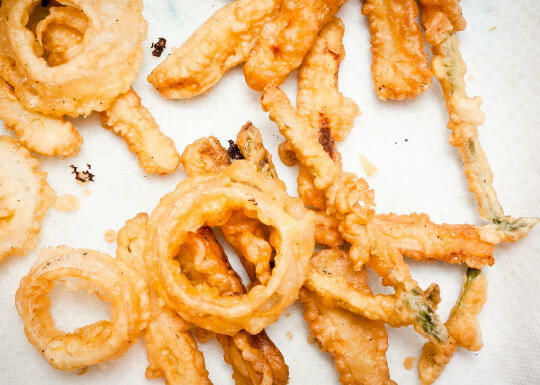 Coat the sliced vegetables in flour, then in the tempura batter, and tempura-fry until golden-brown. Mix the mayonnaise and Sriracha sauce, to taste, and transfer to a squeeze bottle (or a plastic baggie with one of the tips cut off). 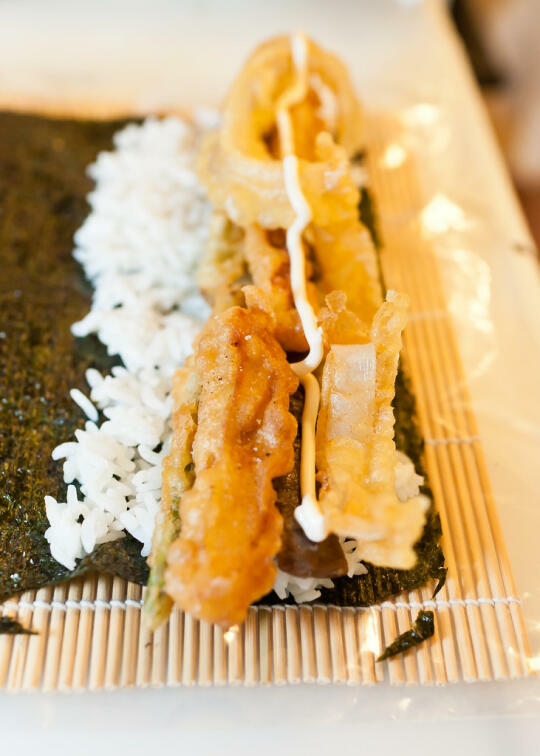 Roll the sushi, using the beef teriyaki, tempura vegetables, and spicy mayonnaise for your fillings. Allison! I can’t believe that you don’t like tomatoes! 🙂 Seriously, it was such a pleasure to meet you tonight at the Homefries retreat and I look forward to talking to you more tomorrow!! P.S. Your Man Sushi looks amazing and I can’t wait to try it out on my husband! 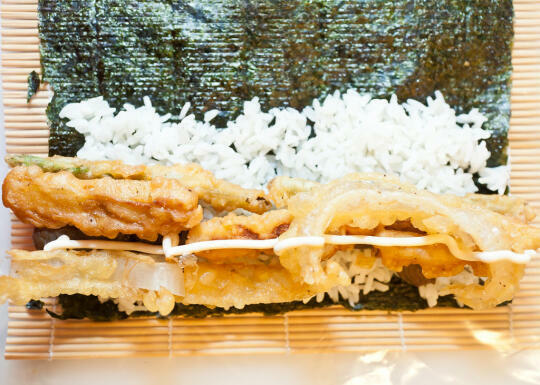 With the opening of 2 very good and affordable AYCE sushi places nearby, I haven’t been making sushi at home very often but I’m getting re-inspired with this post. I can’t remember off hand but have you ever done inside out maki rolls with raw fish draped over the top ie salmon, and then put them under the broiler long enough just cook the fish? toooooo delicious. Great to found that blog. Will subscribe via Google Reader. This is going to go down a treat! My OH doesn’t like sushi at all, but I think I can definitely tempt him with this recipe. 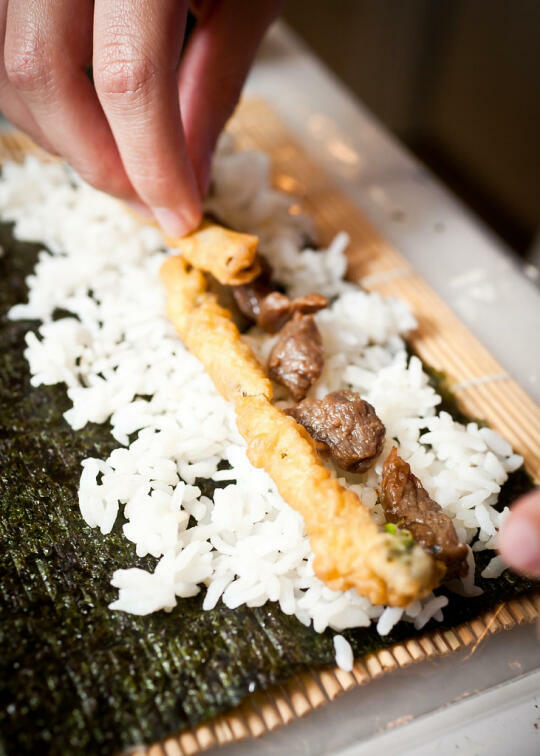 Steak sushi, what a great idea! Looks absolutely delish. I’m definitely going to have to try this out soon. Thanks for the recipe. ppthhhhhhh. try doing a “bar” roll. inspired by buffalo sauce. you can use the fake crab leg or “salmon fries”, thin celery and carrot. This is such a creative idea and looks like it would be so much fun to eat! your sushi looks very bad…I would like to show u how to do it correctly or at least how does my sushi looks like. *man voice* Yes!!! Finally a sushi that a man can eat without shame!! !